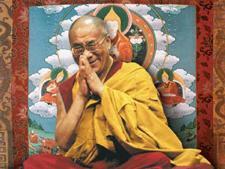 New Delhi, India – His Holiness the Dalai Lama’s journey back to Delhi this morning was uneventful. After lunch he was invited to participate in an Indian Express Adda, an informal interaction with Anant Goenka, Executive Director and Vandita Mishra, National Opinions Editor of the Indian Express group. There were far more people wanting to be part of the audience than there were seats in the room. Many ended up sitting on the floor. Anant Goenka introduced His Holiness as someone widely known for his non-violent struggle for freedom in Tibet and his championing of compassion in the world—someone with a humble but infectious smile. Asked if we can look forward to a world without violence, His Holiness replied that it will depend on what efforts we make. He remarked that the only way to eliminate suspicion is to create friendship. “Here we are sitting together comfortably in peace, but at the same time elsewhere in the world, people are killing each other, some in the name of religion, while children are dying of starvation. How can we remain indifferent? This is why I’m committed to creating a greater awareness of the oneness of humanity—the fact that we are mentally, physically and emotionally the same. “In the past, ethics were the province of religion. But now out of 7 billion human beings more than 1 billion declare they have no faith. Among those who claim to have faith are many who lack conviction. His Holiness mentioned his commitment to promoting inter-religious harmony and spoke of the inspiration he takes from the example of India, which has shown down the centuries that religions can live amicably side by side. He also disclosed that 40 years ago he urged monasteries and nunneries without programmes of study to initiate them. One consequence of this has been that a group of 20 nuns were recently awarded Geshe-ma degrees, equivalent to doctorates, after more than 20 years rigorous study. He compared this to reforms he has introduced in relation to democracy. He failed to achieve reform in Tibet because of Chinese obstruction. However, from the 60s onwards in exile democratic practices have been introduced culminating in an elected leadership that enabled His Holiness to retire from political responsibility in 2011. Regarding his commitment to Tibet, His Holiness voiced his concern to preserve its Buddhist traditions and the Tibetan language and his determination to speak up for the protection the natural environment of the Tibetan, the source of Asia’s major rivers. 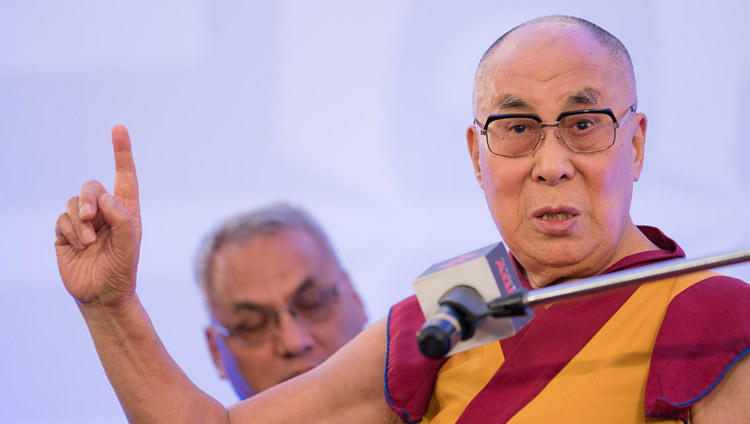 Responding to questions he noted that as early as 1967 he had made clear that whether or not there would be Fifteenth Dalai Lama was up to the Tibetan people to decide. As to whether he expected to see a free Tibet within his lifetime, he observed that under the same system, the control of the same party over many years change has taken place in China. He outlined the introduction of Buddhism to Tibet when the Emperor, Trisong Detsen, despite his links to China, decided to invite an Indian master, Shantarakshita to come and teach. His Holiness spoke of his further commitment to the revival of ancient Indian knowledge in its country of origin. He mentioned recently promising to provide teachers for the centre of learning in Nalanda and declared that knowledge of the workings of the mind and emotions that belongs to ancient Indian tradition is relevant in today’s world. We have material development, he said, but our minds are restless—we can learn how to calm them. He suggested that India is the only country that could easily combine its ancient knowledge with modern education for mutual benefit. A popular chant of Om mani padme hung was played and His Holiness was invited to explain it. He began with the first syllable Om which he said consists of three letters ah, oh and ma that indicate body, speech and mind—the basis for the designation of the ‘I’ or self. Mani, he said means jewel and refers to karuna or warmheartedness. Padme means lotus and indicates the wisdom that understands reality, the idea that nothing exists as it appears. His Holiness reiterated that it is our misconceiving appearance that gives rise to destructive emotions like anger and attachment. He recalled the American psychiatrist Aaron Beck telling him that 90% of the sense of the negativity we feel about someone we’re angry with is mental projection. The final syllable ‘hung’ means inseparable and indicates that the warmheartedness indicated by mani and the wisdom indicated by padme are inseparable. He repeated advice he regularly gives to those who follow the Buddha to be 21st century Buddhists, that is Buddhists who have a more complete understanding of what the Buddha taught.